The Students’ Union of NERIST (SUN) today expressed its gratitude to the HRD ministry for appointing a regular director for the institute but stated that their “agitation is suspended only and not called off “. The students of the North Eastern Regional Institute of Science and Technology (NERIST) after eight days of agitation got a regular director on Tuesday but many feel that they have been defeated in their cause. 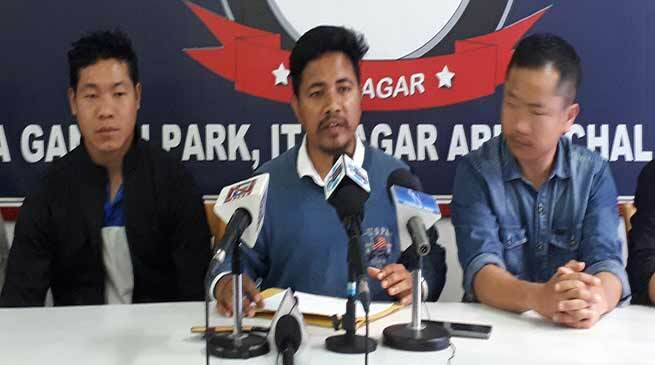 “Most of the stakeholders like the SUN, NERIST Faculty Association, NERIST Employees Association and others are not happy with the appointment of Dr H S Yadav as its regular director”, said SUN president Banta Natung who was addressing a press conference at the press club here today. “There were tears in the campus instead of celebrations”, added Natung. “We are not against Dr Yadav or question his qualifications but since day one we had made it clear that we want a fresh director, preferably from outside, to take charge of the institute”, said Natung. Dr Yadav, who is a faculty of Chemistry department of the institute, also served as an in-charge director of NERIST. Natung, however, informed that they are still on the process of discussing their next move. In the meantime, Natung hope that the new director will take up the matter of developing the hostel facilities of NERIST, upgrade the technical labs, create separate quarters for PhD scholars, and adopting zero tolerance towards teaching. He added that the office of the director should not be compromised or get influenced so that the lost glory of the institute can be brought back once again.